Each morning I prepare my husband and myself for the day ahead by reading aloud our horoscopes by astrologer Linda Black, despite the fact that most days they seem to address other people’s lives. After 40 years together it’s easy to feel skeptical about the new romances coming our way once or twice a week. Maybe because of the economy, we’re getting regular advice not to spend money, advice that’s especially hard to follow since the carrier drops the bills in the mailbox almost daily, paying no heed to Ms. Black’s warnings. But yesterday’s was different. Now you’re on a roller coaster, wrote Ms. Black. 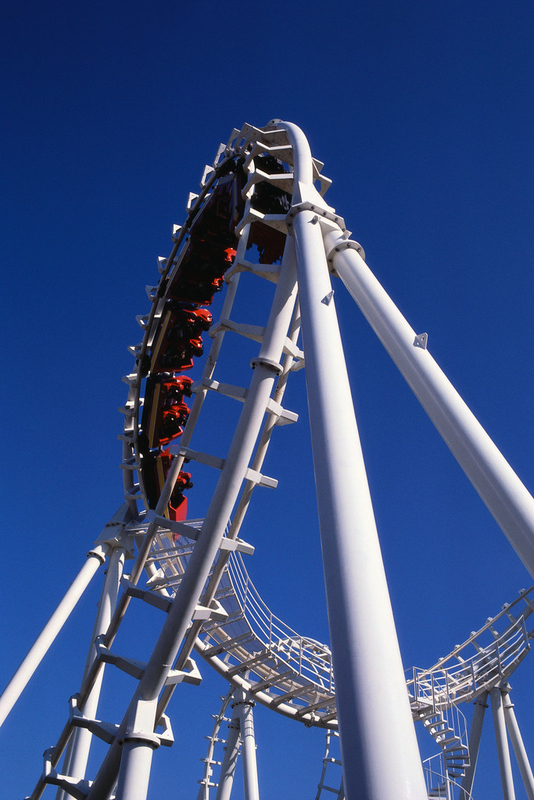 Will you laugh and scream and enjoy the ride, or cry the whole way and want to get off? You may go through both sensations. I think if she wanted to repeat these same words every day for a year or so, she’d still be hitting the bullseye. Why? Because yesterday, I returned to school for the first time in 25 years to begin a year-long writing program. In some ways this first day of school wasn’t that different from any other first days I can remember. I was excited, nervous, and eager, emotions most children can identify with when they go back to the classroom each fall. I arrived in class about 15 minutes early, not for the sake of impressing the teacher, who drifted in about two minutes ahead of the start time, but because after-work traffic is unpredictable and I dread walking in late. I was early enough to check out my classmates, just like I would have done in high school or college, searching for the bull-shitter, the blusterer, the kiss-up or the dominator. Happily, either there were none or they are waiting until after Halloween to shed their disguises. The teacher behaved as graciously as the students. She was warm, encouraging, straightforward, clear, and flexible. I settled into my seat on the roller coaster while the attendant made sure I was fastened in. At the beginning of the second hour of class, there came a moment of fear after she asked each of us to stand and present our working titles, genres, main characters and a four-sentence description of the plots of our novels. Not being certain of any of these, I felt like my presentation came off weak, but stopped myself in mid-self-flagellation and continued feeling upbeat until class ended. At this point, the roller coaster was in climbing mode, moving slowly, fighting against gravity. After explaining what a scene was, the instructor put us to work writing our opener, something to grab the reader, thrust him quickly into a conflict that the protagonist then resolves or appears to resolve. Following this she gave a second assignment, three more pages to describe the life-changing event that our main character would experience a few scenes later. Too excited to wait, I began inputting while she was still talking. The first sentences spilled out quickly. At last I had begun the project I had dreamt about for the past year. The roller coaster was overcoming inertia and approaching its peak. I loved what I had written in class, went to bed thinking about how to extend and improve on it and awoke at 6 am thinking that I had not paid any attention to the definition of a scene, that my character was too shallow, not particularly interesting and that my plot ideas would take me through about ten pages total. Unbeknownst to me, while I slept the roller coaster had begun its precipitous descent and I was clinging to the bar while my body lifted off the seat. While eating breakfast and taking a morning walk, I started to put more flesh on the frame of my character, came up with a crisis to put her in, imagined an additional character, and thought of a variation in the original plot that would give me more than 10 pages and let me wax satirical. The ticket taker tore my ticket and pulled the lever to start the coaster’s uphill climb again. Do you ever have roller coaster days? years? lives? You kept me reading until the end. You hit the nail on the head with the description of waking up the next morning thinking of all the problems with what you loved the day before. I have my “Will you still love me tomorrow?” rule: Often I’ll feel excited about something I’ve created (maybe jewelry, maybe writing) but my rule is to hold judgement until the next day, when I’m feeling more objective and able to see the shortcomings that seemed to use evening’s soft light to elude my notice. I’m okay with it though. Each awkward version paves the way to the next — and better — version. And you can’t create if you’re censoring yourself. Plenty of time for that the next morning. So I guess we’ll keep buying those tickets. And let’s remember to scream with delight when the scary part is also the fun part.